Software Consultancy (Official Valomnia Partner) who is specialized in Sage Integrations platforms and Oracle Fusion ERP & CRM implementations along with Valomnia’s digital platform will support ICE‘s digital transformation through a smooth integration with Sage X3 to allow ICE to fully automate its sales and distribution employees activities on the field. 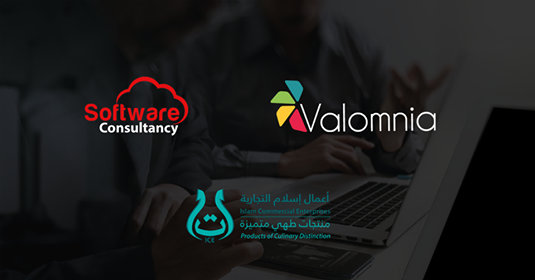 In fact, Software Consultancy and Valomnia will help ICE (Islam Commercial Enterprise), one of Saudi Arabia’s high quality food import and distribution companies established in 1972 supplying only the best quality products to Saudi Arabia and the Gulf, to digitally manage its daily operations and have a real-time data overview at all times from anywhere. – A VAT ready mobile App with a digital catalog featuring all the company’s products, customers, price lists, promotions, order histories and sales statistics allowing field employees to close more deals wherever they are. – Valomnia will also help field sales employees take pre-orders and orders directly on the mobile devices with the ability to check stock quantities, apply discounts and capture the customer’s digital signature. – Full, fast and secure integration engine between Sage X3 and Valomnia covering all the business needs and operations. This project allows the partner, Software Consultancy, to grow his revenues through a SaaS recurrent revenue model and to handle the entire integration implementation phases. As a matter of fact, Valomnia was chosen for its flexible, proactive and agile model that offers a quick implementation and response time in addition to offering a fresh digital approach to field sales and distribution activities. Valomnia was also chosen for being a great customer listener and showing its full readiness to make the necessary support when it comes to satisfying customer needs and expectations as well as constantly implementing innovative changes to the Valomnia platform.